Each year, fans of The Lord of the Rings: The Card Game have two unique opportunities to explore more of Middle-earth and play their favorite cooperative card game. One of these prized opportunities took place recently at Gen Con 50 in Indianapolis. However, the other will take place worldwide in local stores as part of our annual Fellowship Event later this year! Players who attend these events are treated to a new scenario and the chance to play with people beyond their usual group. Starting December 9th, up to 12 players take the fight to Sauron in Assault on Dol Guldur, a scenario so epic it is available in 2017 only at Gen Con and to stores for the 2017 Fellowship Event! 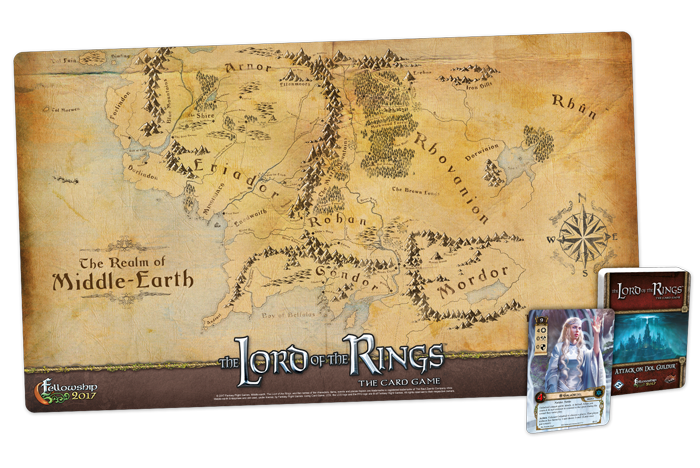 Each Fellowship Event Kit includes three copies of Assault on Dol Guldur, three Galadriel alternate art cards, and three gorgeous playmats featuring a map of Middle-earth. Each event can support 3 players, each getting 1 of everything, so plan accordingly if you’d like to bring friends, and pre-register below. Preregistration may be done individually or for a whole table, if you’re bringing all your friends along and want to lock in seats together. 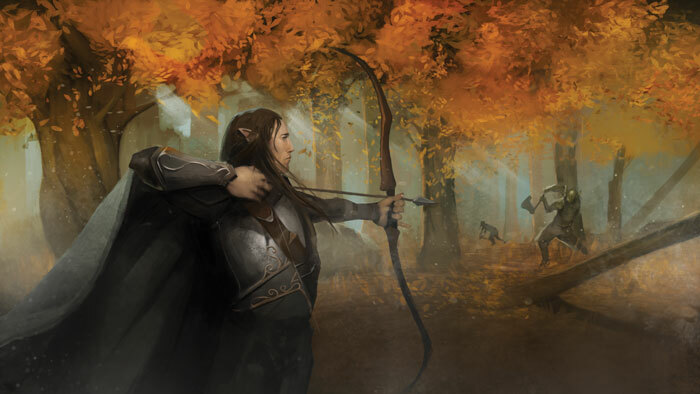 In Assault on Dol Guldur, players join the host of Lórien in a direct attack against Sauron’s Mirkwood stronghold taken straight from the appendix for The Return of the King. This unique scenario can be played by 1-4 players in Standard Game Mode or 3-12 players in Epic Multiplayer Mode. Only one copy of Assault on Dol Guldur is required to play Standard Game Mode, while three copies are required for Epic Multiplayer Mode. The scenario includes two double-sided setup cards, one for each mode, that players use to play the game in the desired fashion. In Epic Multiplayer Mode, a group of 3-12 players are divided into three teams, and each team has its own encounter deck, quest deck, and staging area. Each team begins the game at their own stage one, but when everyone advances to stage three of Assault on Dol Guldur, they will find four different stage threes to choose from. Each one represents a different part of the siege, and only the team at that stage can make progress on it. In this way, each team is dependent on the others to do their part in order to win the battle and defeat the scenario. Even though all three stages are interconnected, each one counts as its own game. So a card ability at one stage cannot affect the game state at another stage, unless it specifically says it does. Because each stage is its own game, two players at different stages can use the same unique card. That means players only need to coordinate their heroes with the other players on their team, not the entire group. Of course there’s more to it than that: Each stage comes with its own risks and rewards, making the decision of which stage three each team chooses to quest at a compelling and important choice. To add to the richness of that choice, each stage three has a corresponding Dol Guldur location and Lieutenant enemy. Each Dol Guldur location cannot be explored unless the players are at the matching stage, and each Lieutenant enemy brings a danger of its own.